Did you watch Ask the Prime Minister on Channel NewsAsia last night? I was following the comments on Twitter at the same time – and it was a parallel universe. The tweets running from the jokey to the sarky were a lot more unruly than the ones TV presenter Sharon Tong cherry-picked for reading out to the Prime Minister. The first tweet I saw said: “That’s a nice shirt. Where did you get it? Or did your wife get it for you?” It was utterly off-topic and not PM’s ear-worthy, so Ms Tong was right to ignore it. But if like me you watched the TV show and had Twitter open at the same time, you saw how Channel NewsAsia filtered the comments. That’s the problem with social media. It’s beyond control. Prime Minister Lee admitted as much. When Ms Tong asked if governing had become more difficult; yes, he said, and one reason was social media. He recalled Michael Bloomberg, the founder of Bloomberg News and outgoing mayor of New York, who said social media was an instant referendum on everything and could make governing more difficult. PM Lee said it with a smile, but it was clear the 24/7 digital flak occasionally touched a nerve. The government is expected to do everything, he said, when asked what is it about Singaporeans that he would like to change. Who knows, maybe deep in his heart, he thinks his father had it easier. The old man had to face communists, who could be locked up, not bloggers, who can’t unless they fan racial or religious feelings. Sometimes, even that needs a light touch. Singapore has changed, the PM said. That was evident in the relaxed manner he talked to MediaCorp editor-in-chief Walter Fernandez and Ms Tong. He answered questions with a smile unlike his father, who could not help looking stern. He sounded like his father speaking about hunger and achievement. And also while talking about politics. Ms Tong mentioned a tweet which said politics nowadays was “about perceptions, about being populist”. “I don’t think politics today is about perceptions and about just appearing good,” countered PM Lee. “I think politics has to be about serious things… you must do the right thing, that you must have conviction in what you are doing, But at one point where I disagree with the quote is that, at the end of the day, we must also make sure that we win the next election because if we can’t win the election, then you can’t do any good for the people.” Echoes there of his super-competitive father, Mr Lee Kuan Yew. If that looks like a hyperbole in print, it was different on TV. The PM looked relaxed and confident as if talking to friends about things on which they all agreed. The interviewers never once pressed him on anything he said. This wasn’t Hard Talk. It was the head of the government talking to state television. 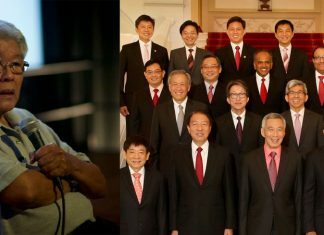 PM Lee to his credit spoke man to man, mindful of the viewers – and voters. He might not have disarmed his critics, but he looked good on TV. Maybe he should do it more often. In fact, he seemed so comfortable that maybe he should next do an Obama. Remember those townhall meetings? Instead of sitting next to Mr Fernandez, who nodded, frowned and smiled like a man in the know, one insider speaking to another, he could be talking to ordinary people – real, live voters who ultimately hold the keys to Istana even though they are not allowed in every day.